Encuentra asistencia y herramientas específicas para tu Samsung Convoy 4 en Internet. Conoce tu nuevo Samsung Convoy 4 con esta guía de consulta rápida. Learn more about the back of your Samsung Convoy 4. An interactive map of the Home screen and buttons on your Samsung Convoy 4. Learn how to power on and shut down your Samsung Convoy 4. Here's info on the battery specs (e.g., Usage Time, Standby Time, etc.) for your Convoy 4. To make your Convoy 4 visible to Bluetooth devices, view this info. An interactive guide on how make phone calls using your Samsung Convoy 4. For info on common camera settings (e.g., flash, timer, etc. ), check out this info. A visual guide for changing the picture storage location on your Samsung Convoy 4. Aprende a grabar un video usando tu Samsung Convoy 4. Discover how to take a photo using your Samsung Convoy 4. If you can't transfer media between your Samsung Convoy 4 and PC, view this info. Learn how to add a new contact to your Samsung Convoy 4. Find out how to add a picture to a contact on your Samsung Convoy 4. Learn how to assign a ringtone to a contact, so you know who's messaging your Samsung Convoy 4 without looking at it. To allow or restrict access to services on your Convoy 4, view this info. Explore how to access settings on your Samsung Convoy 4 to change alert sounds, turn off GPS and more. Learn how to change notification sounds on your Samsung Convoy 4. Find out how to perform a factory reset your Samsung Convoy 4. Explore ways to mute your Samsung Convoy 4. An interactive guide on how to restart your Samsung Convoy 4. Learn how to bookmark a website on your Samsung Convoy 4, so it's easy to find later. A visual walkthrough of opening, closing and switching between windows or tabs in the web browser of your Samsung Convoy 4. 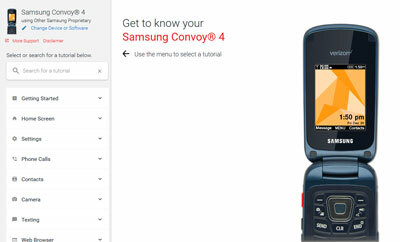 Discover how to find a website using your Samsung Convoy 4. Discover how to change the language settings on your Samsung Convoy 4. To unlock the screen on your Samsung Convoy 4, check out this info. A visual guide for activating your Samsung Convoy 4. To free up space if your device runs slow or crashes/resets, or you can't save media, view this info. View this info on memory card formatting options for your Convoy 4. See how to open apps on your Samsung Convoy 4. To view the software version your Samsung Convoy 4 is running, check out this info. If the SIM PIN for your Convoy 4 is blocked, here's how to unblock it. Discover how to put and remove a microSD card into your Samsung Convoy 4 to add memory for photos, videos, music, documents and more. To utilize the speakerphone functionality on your Convoy 4, view this info. To add, remove or edit the text message signature on your Convoy 4, view this info. To receive delivery confirmation for messages sent from your Convoy 4, view this. To change the TTY settings on your Convoy 4, check out this info. Learn how to change the background of the Home screen on your Samsung Convoy 4.